Angela Merkel is besieged. The Bavarian sister party of the German chancellor’s Christian Democratic Union wants tougher frontier controls. The anti-migrant pose struck by Horst Seehofer, the Christian Social Union interior minister in Ms Merkel’s coalition, is cheered by populists from Warsaw to Rome, via Vienna and Budapest. Have any of them thought, some of us wonder, what a Germany taking a nationalist turn might actually look like? Mr Seehofer’s motives are transparent. The CSU suffered a mauling at the hands of the unashamedly xenophobic Alternative for Germany (AfD) in the 2017 national election. Facing a state poll in October, the party now wants to outflank AfD. EU leaders will discuss a European-wide migration scheme later this month. If he is not happy, Mr Seehofer is threatening unilateral controls. Many Germans — a majority, the latest poll suggests — remain suspicious of the chancellor’s open borders strategy. Among neighbours, the Visegrad Four — Poland, Slovakia, the Czech Republic and Hungary — are fierce critics. Jaroslaw Kaczynski, the leader of Poland’s ruling Law and Justice party and Hungary’s prime minister, Viktor Orban, scorn efforts to disperse asylum seekers across the union. Italy’s new government — a populist coalition of the Five Star Movement and the anti-migrant League — is shutting ports to refugees crossing from north Africa. Matteo Salvini, the interior minister and leader of the League, made it an early act to turn away the rescue ship Aquarius. Austrian conservative leader Sebastian Kurz proposes an “axis” with fellow hardliners in Rome and Berlin to seal the frontiers. The populists are united in their simple sloganising. Hungary’s population is shrinking and ageing, as talented young people seek opportunities elsewhere. Yet Budapest is proud of its barbed-wire camps for asylum seekers and migrants unfortunate enough to cross the border. The reality, of course, is that no single government can take control of its frontiers. The narrow national interests held dear by populists frequently collide with each other. It is forgotten now, but Ms Merkel kept open Germany’s borders in 2015 to ease pressure on Austria. Vienna risked being overwhelmed by refugees bussed from, well, Mr Orban’s Hungary. The nationalists’ pitch is to fear and emotion rather than reason. If they thought about it, they would know that beggar-thy-neighbour policies cannot work. Closing a border has a ricochet effect. Mr Kurz must surely realise that Mr Seehofer’s plans would leave Austria to cope with refugees stranded on the wrong side of the German border. Does Mr Salvini understand, one wonders, that Mr Seehofer wants those arriving at the German frontier to be returned to the place they were first registered? Much of the time, that would be Italy. The Mediterranean front-line states complain their northern partners do not share the migrant burden. Polish and Hungarian nationalists would be the very last to make such an offer. Untying this Gordian knot with a migration system that is humane, fair and sustainable requires a collective effort to harden the EU’s external borders and equitably accommodate those granted asylum. It demands also more effort — and aid — to help sub-Saharan Africa. This is what Ms Merkel and Emmanuel Macron, the French president, have been discussing. Mr Seehofer has no real alternative. He is far from alone, however, in selling his party as one that puts Germany First. Nor is a rising nationalist mood confined to hostility towards migration. Markus Söder, the CSU prime minister of Bavaria, thinks the country has broader lessons to learn from Donald Trump’s belligerent unilateralism. It is not at all hard to imagine where a new German nationalism could lead. The AfD made its name opposing financial support for weaker members of the eurozone — the so-called transfer union that leaves Germans at the mercy of supposedly profligate southern Europeans. As principal EU paymaster, why not extend the principle beyond the single currency to other projects? Mr Kaczynski is forever hurling insults in the direction of Berlin. Yet Poland is the biggest recipient of EU aid. Why should German taxpayers write large cheques to Warsaw? Likewise for Hungary, where the government is substituting crony capitalism for the market economy — in significant part at Germany’s expense. Berlin could better deploy its economic clout to projects that confer direct national advantage. Those with dark memories of war have less to fear. There is nothing militaristic about Germany First politics. The impulse, rather, is isolationist. Most Germans would probably spend less on defence. And why not? The nation is too powerful to be threatened by its neighbours. Berlin can always reach an accommodation with Moscow: Russian energy for German technology makes for a natural fit. Let Poland and others on the EU’s eastern frontier pay for Nato if they feel threatened by Russia. Germany is some way off reaching such judgments. Ms Merkel is still convinced — and rightly so — that the nation’s long-term interests reside in liberal internationalism. The chancellor will not easily surrender her convictions. But she has been weakened. After 12 years, her time is running out. And Mr Seehofer and his allies are setting a different direction of travel. Those cheering populists elsewhere should be careful what they wish for. 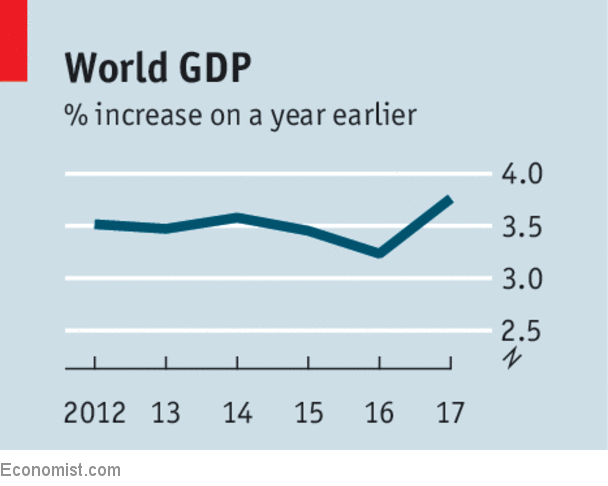 Could a trade war derail global growth? LOOK at the headlines, and you would struggle to believe that the global economy is in good health. 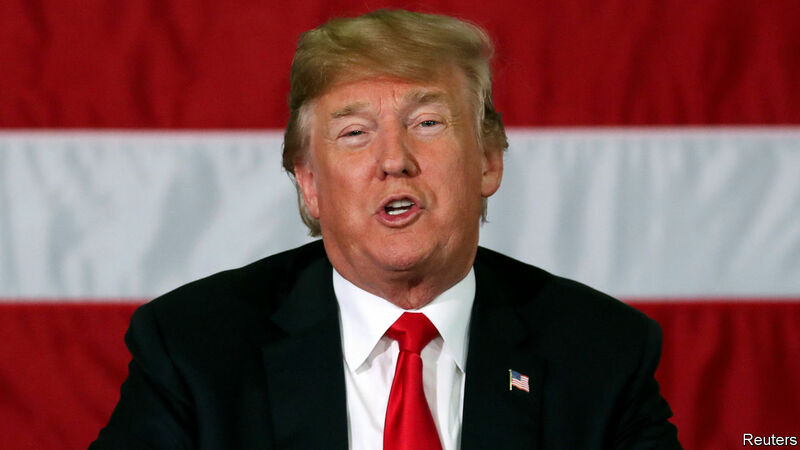 President Donald Trump continues to fire off volleys in his inchoate trade war, throwing financial markets into turmoil and drawing retaliation. The Federal Reserve is raising interest rates—an activity that usually ends in a recession in America. Tighter credit and a rising dollar are squeezing emerging markets, some of which, such as Argentina, are under severe stress. Yet the world economy is thriving. Growth has slowed slightly since 2017, but still seems to be beating the languid pace set in the five years before that. America may even be speeding up, thanks to Mr Trump’s tax cuts and spending binge. A higher oil price, which in past economic cycles might have been a drag, is today spurring investment in the production of American shale. Some forecasts have growth exceeding 4% in the second quarter of 2018. This sugar rush, however, brings dangers. The first is that it provides temporary political cover for Mr Trump’s recklessness. The second is that, if America accelerates and the rest of the world slows, widening differentials in interest rates would push up the dollar still more. That would worsen problems in emerging markets and further provoke Mr Trump by making it harder for him to achieve his goal of balanced trade. The trade war is the biggest threat to global growth (see article). On June 15th the White House confirmed that a 25% tariff on up to $50bn of Chinese imports would soon go into effect. Three days later, after China promised to retaliate, the president expanded, by as much as $400bn, the other goods America is threatening to tax. If he follows through, nine-tenths of roughly $500bn-worth of goods imported from China each year will face American levies. Meanwhile, the European Union is poised to impose retaliatory tariffs in response to America’s action against EU steel and aluminium. No wonder markets have caught the jitters. The president is unafraid of escalating trade disputes because he believes he has a winning hand. America buys from China almost four times as much as it sells there, limiting China’s ability to match tariffs. The White House hopes this imbalance will lead China to yield to its demands, some of which (cutting the theft of American firms’ intellectual property) are more reasonable than others (shrinking the bilateral trade deficit). But Mr Trump overestimates his bargaining power. If China runs out of American goods to tax, it could raise existing tariffs higher. Or it could harass American firms operating in China. More important, the president’s mercantilism blinds him to the damage he could inflict on America. He thinks it is better not to trade at all than to run a trade deficit. This folly also dictates his tactics towards Canada, Mexico and the EU. Mr Trump could yet withdraw from the North American Free-Trade Agreement and slap tariffs on cars. The problem is not that America depends on trade. In fact, it is a big enough free-trade area for the eventual damage to GDP, even from a fully fledged trade war, to be limited to a few percentage points (smaller, specialised economies are more dependent on trade and would suffer a lot more). Such self-inflicted harm would impose a pointless cost on the average American household of perhaps thousands of dollars. That would be bad, but it would hardly be fatal. The bigger issue is the vast disruption that would occur in the transition to more autarky. America’s economy is configured for designing iPhones, not assembling their components; the innards of its cars and planes cross national borders many times before the final product is ready. Faced with tariffs, firms have to redirect labour and capital to replace imports. Some analysts attribute Mr Trump’s presidency to the economic shock from trade with China after 2000. The turmoil caused by reversing globalisation would be just as bad. One estimate puts American job losses from a trade war at 550,000. The hit to China would also be severe. Any adjustment would be prolonged by Mr Trump’s unpredictability. Without knowing whether tariffs might rise or fall, what company would think it wise to invest in a new supply chain? It is difficult to imagine such a realignment without a global recession. Tariffs temporarily push up inflation, making it harder for central banks to cushion the blow. The flight to safety accompanying any global downturn would keep the dollar strong, even as America’s fiscal stimulus peters out after 2019. So be wary. The trade war may yet be contained, to the benefit of the world economy. But America is the engine of global growth. In Mr Trump, a dangerous driver is at the wheel. Europe and China have been two of the main targets in the United States’ recent efforts to cut its trade deficit. At the start of this month, the Trump administration slapped tariffs on aluminum and steel from European Union members (along with other countries), after initially exempting the bloc from the tariffs. The EU has said it will impose its own set of tariffs on the U.S. in July. Germany, Europe’s economic powerhouse, has been particularly vocal in its opposition to the American tariffs. Its economy is heavily dependent on exports, which accounted for 46 percent of Germany’s gross domestic product in 2016. Though Germany’s main export destination is the European Union (58 percent of goods exports in 2016), its second-largest customer is the United States (8.8 percent), followed by China (6.4 percent). China, meanwhile, has been engaged in a trade dispute of its own with the U.S. essentially since President Donald Trump took office. Most recently, the Trump administration imposed tariffs on $50 billion worth of Chinese imports last week, and China responded by promising to do the same. Trump also threatened to impose tariffs on an additional $200 billion worth of Chinese goods this week, further escalating the trade row. Given that exports made up 19.6 percent of China’s GDP in 2016, any disruption in trade flows will be a big concern for the Chinese. China and Germany now find themselves in a peculiar position. Neither is in a position to engage in a trade war, yet both are increasingly at odds with the world’s largest economy. Given this scenario, they may look for alternatives to the U.S., and as the world’s second- and fourth-largest economies, they may see each other as options. In light of the intensifying trade dispute with the U.S., this Deep Dive will explore the possibility of greater economic cooperation between China and Germany. One thing the Chinese and Germans have in common is that both have benefited from the relaxation of trade restrictions. Since the gradual opening of China’s economy under Deng Xiaoping, the abundance of cheap labor in China has attracted investment from around the globe. Cheap Chinese-made products have flooded markets around the world, including the U.S., which consumed 19 percent of Chinese exports in 2017. Germany, meanwhile, has profited massively from the European common market and the common currency. Under the euro, German exports are cheaper and more competitive than they were under the deutsche mark. Trade between the two export-dominated economies is growing: China became Germany’s top trade partner in 2016, when trade between the two countries reached 170.2 billion euros ($197 billion). It grew to 186.6 billion euros the following year. Beijing has a trade surplus with Berlin, even though only 3.1 percent of Chinese exports (worth $71.2 billion) were destined for Germany in 2017. For China, there are some notable benefits to trade with Germany. In Germany, the Chinese can access complex technologies that are not yet produced in China. In 2017, the Chinese invested $13.7 billion in German companies, making the country China’s top destination for investment in Europe. As part of the Made in China 2025 strategy, a plan announced in 2015 to modernize Chinese industry, China is trying to increase development of high-tech sectors in the country, and for this, it needs access to technologies from foreign firms. Investing in German companies may prove useful in this regard. Foreign investment in Germany isn’t tightly regulated (for now, at least), making it easier for Chinese businesses to gain a foothold there. According to a study by the Bertelsmann Foundation, a majority of Chinese investments in Germany are made in sectors that are the focus of the Made in China 2025 strategy. Prior to 2015, the year the strategy was announced, there was little Chinese investment in the biomedicine and biomedical devices sector, for example. Since then, there have been 18 such partnerships between Chinese and German companies. The Bertelsmann Foundation looked at 175 merger and acquisition transactions in which the Chinese bought at least a 10 percent share in German companies from 2014 to 2017. Nearly 64 percent of these investments were directed at sectors that China plans to dominate by 2025. Most of the investment related to Made in China 2025 is focused on three regions: Baden-Wuerttemberg (23 percent), North Rhine-Westphalia (20 percent) and Bavaria (16 percent). These are precisely the regions where most world-leading German tech firms are based. In addition, Germany serves as a key hub for Chinese goods destined for European markets by sea and rail. One in three containers that arrive in Hamburg, Germany’s main freight port, come from China, and several rail lines used to transport cargo by train to Europe begin in China and end in Germany, including the Chongqing-Duisburg line. There are also advantages for Germany from this relationship. China is a top destination for Germany’s high value-added exports, and there are more than 5,000 German companies operating there today. Until recently, China was the main source of cheap labor for German multinational corporations. German imports from China include products made in China for German companies and products sold by Chinese companies, including low added-value products such as textiles. In 2016, 50 percent of EU foreign investment was destined for China. German investors are attracted to China because of low labor and R&D costs. According to a 2017 survey by the German Chamber of Commerce in China, more than half of new investment by German companies in 2018 will be in manufacturing facilities. German investment is concentrated in the city of Taicang, which is close to Shanghai, one of the busiest ports in China but a much more expensive city from which to base a business. Since August 2016, Taicang has attracted more than 250 small and medium-sized German businesses that together have revenue of roughly $2.72 billion. The Taicang German Center, a project created by a German bank and supported by federal and state ministries in Germany, helps German businesses enter the Chinese market. Many businesses operating in Taicang are related to machine construction, electronics and energy. Shanghai, Beijing, Guangzhou and Shenzhen are also popular cities for investment. If Germany were to try to redirect its trade from the U.S. to China, it wouldn’t have to significantly adjust the composition of its exports. In 2017, China was Germany’s third-largest destination for exports (and top supplier of imports). In 2016, roughly 67 percent of Chinese imports from Germany (worth $56.1 billion) and 58 percent of U.S. imports from Germany (worth $66 billion) were part of the transportation and machinery sectors. Since German exports to both countries have a similar profile, reorienting German exports to the Chinese market wouldn’t require a massive shift in production. There is, therefore, a lot of potential in this relationship. But there are also many hurdles. From the Chinese perspective, the main challenge to seeing Germany as an alternative to the U.S. market is the sheer size of the country’s population. The United States is a wealthy country with a population of 327 million, whereas Germany has a population of only 82 million. Because of this gap, Germany can’t absorb the quantity of Chinese goods that the United States does. From the German perspective, there are three main obstacles to increasing investment in and trade with China. The first is costly bureaucratic delays. China requires most products sold there to have a China Compulsory Certificate, which requires factory visits at the expense of the manufacturer to ensure compliance and the submission of valuable company information. The certification process is usually very lengthy, providing a window of opportunity for Chinese counterfeits to appear on the market before the original product does. This is a hurdle particularly for small and medium-sized businesses with limited resources. There are also restrictions on foreign investment in certain industries such as automobiles, petrochemicals and steel. In many manufacturing and service sectors, European investors are prohibited from setting up enterprises that are fully foreign owned and must instead establish joint ventures with Chinese partners. These partnerships usually involve sharing proprietary technology and know-how with Chinese counterparts, which contributes to the second barrier for German firms: technology transfers that hamper European competitiveness in China and beyond. Over the past two years, Germany has grown increasingly worried that Chinese investment in German high-tech companies in industries such as robotics, aerospace and pharmaceutics is not driven purely by profit. That these industries are also targets of the Made in China 2025 strategy suggests that these investments are actually intended to help China become a global competitor in sectors currently dominated by industrialized economies. European restrictions on foreign investment are much laxer for now than U.S. and Japanese restrictions, making Germany an attractive destination for Chinese firms (and the Chinese government) looking to acquire advanced technologies. This became problematic in 2016 when Midea Group, a major Chinese manufacturer of household appliances, purchased a majority stake in German robotics manufacturer KUKA. KUKA products are widely used in German manufacturing, including in the auto industry, the country’s most important export sector. In this sense, KUKA robotics technology has strategic value for a number of German corporations. As a result of the deal, Midea Group acquired high-end technology in factory-use robotics, meaning that German manufacturing firms would no longer be the primary users of this cutting-edge technology. In 2017, Germany, along with Italy and France, asked the European Commission to increase Brussels’ capacity to screen and, if necessary, block foreign investment in European companies. German concerns about technology transfer to Chinese competitors, either through purchases of German firms or through joint ventures with Chinese companies, are increasingly a roadblock in developing closer trade and investment relations. The third obstacle to deepening ties between Germany and China is politics. In 2012, China started the 16+1 initiative to expand cooperation with countries in Central and Eastern Europe. By excluding Brussels and Western European states, this project offers participating countries an alternative source of investment to the EU. The Chinese have promised $17 billion in total, mainly for infrastructure projects, far less than the European Cohesion Fund from which Poland alone will receive 86 billion euros from 2014 to 2020. Yet Germany fears that closer bilateral relations between China and select EU members can undermine cohesion on foreign and economic policy. It can point to several examples over the past couple of years to prove its point. In 2016, Hungary and Greece blocked direct references to Beijing in the EU’s statement on The Hague Tribunal’s ruling against Chinese legal claims in the South China Sea. In 2017, Hungary declined to sign an EU letter denouncing reported torture of detained lawyers in China. Also in 2017, Greece blocked efforts to issue an EU statement at the U.N. Human Rights Council condemning China’s human rights record. When France put forward a proposal to screen foreign investments at the EU level in June 2017, it was met by opposition from a number of members, including southern European countries that feared the new regulations would hurt foreign investment. Greece specifically mentioned Chinese investments as a reason for opposing the move. Chinese investment is attractive to Central and Eastern European countries because it doesn’t have the same political strings that are attached to EU funding. For the 2021-27 budget cycle, the European Commission is hoping to tighten conditions for receiving cohesion funds. The proposed plan is to make funding dependent on compliance with the rule of law and acceptance of refugees. These reforms are supported by Germany as a means to coerce EU members to follow Brussels’ directives but rejected by countries like Hungary and Poland, which have been at odds with Brussels over domestic policies. Chinese investment doesn’t have any such preconditions, but the Chinese do have political motives for offering this investment. They are looking for allies within the European Union to sway EU economic policy to prevent restrictions on Chinese investment and open the door to more joint projects with China’s One Belt, One Road initiative. The Chinese don’t necessarily want to weaken the EU, but their insistence on working with select partners and bypassing Brussels adds another layer of friction in an already rocky environment for the EU. This is a problem for the EU because decision-making is mainly based on consensus. Chinese investment is outwardly used by Central and Eastern European states as a bargaining chip in negotiations with Brussels over funding allocations, regulations and so on. For countries that are part of the German production chain, it can also be used as leverage against Berlin if Germany tries to force compliance with EU directives. Germany may be willing to accept a weaker role for Brussels if it helps preserve the common market, but Berlin wants to make sure any devolution of powers would serve its interests and would not be forced on Brussels or Berlin. Germany is therefore increasingly wary of Chinese trade and investment in Europe because it exacerbates political divisions in the EU. In May, German Chancellor Angela Merkel traveled to Beijing to meet with Chinese President Xi Jinping. They discussed their support for the Iran nuclear deal, from which the U.S. withdrew just weeks prior. They also said they hoped to preserve the Paris climate accord and expressed their support for open trade. Merkel’s visit to China can be seen as a signal to Washington that both countries can cope with U.S. pressure on the trade front by forging closer bilateral ties. But once you look deeper at the relationship between the two countries, it’s clear that this alternative is not as promising as it may appear. From the Chinese perspective, there are many benefits to increasing trade with and investment in Germany. Access to sophisticated technologies and few limits on foreign investment are just a couple of examples. True, Europe is in the process of establishing new regulations that will complicate Chinese investment and trade on the Continent. But for now, and for the foreseeable future, Germany will remain an attractive destination for Chinese investment and exports and a steppingstone to the rest of Europe. But for Germany, there are several barriers to increasing trade with China, including bureaucratic red tape, stiff competition from Chinese firms and fear that China will appropriate sensitive technologies that have given German firms an upper hand in global markets. Given that the German economy is so reliant on exports, it will want to protect its competitive advantage at any cost. There are also fears that Chinese investment could drive a wedge between EU member states. For Germany, then, trade with the U.S. is still more desirable than trade with China. Berlin and Beijing will still continue to trade and forge ties in areas of mutual agreement, but neither can be a substitute for the U.S. market. - The 2018 "official" U.S. debt figure of $34 trillion is 120% of GDP and projected to double as a percent of GDP within the next 20 years. It's big. - If we add "off-the-books" net obligations like Social Security and Medicare, our all-in debt, or so-called "fiscal gap", rises to $110 trillion, or 390% of GDP. It's scary. - Raising taxes and reducing benefits won't restore solvency. Something is going to break, and it won't be pretty. We're broke and no one seems to care. We're all aware that this country owes a lot of money, but no one cares because we're leading pretty good lives here. We have yet to feel the consequences of being broke, but that won't last long. Some things are already breaking, and an ultimate breakdown is on the way. 2018 is the first year when tax receipts won't pay for Social Security and Medicare benefits. We are spending down the corpus, and will have spent all of the Social Security Trust by 2034, while Medicare monies will only last until 2026. This might sound like we have time, but we don't, especially since nothing is being done to head off these catastrophes. It's full speed ahead into the reckoning. Furthermore, some large pension funds are broke, and are likely to renege on their promised benefits. In the following, we share some details on this bankruptcy, and offer some actions that might help, although they are unlikely. 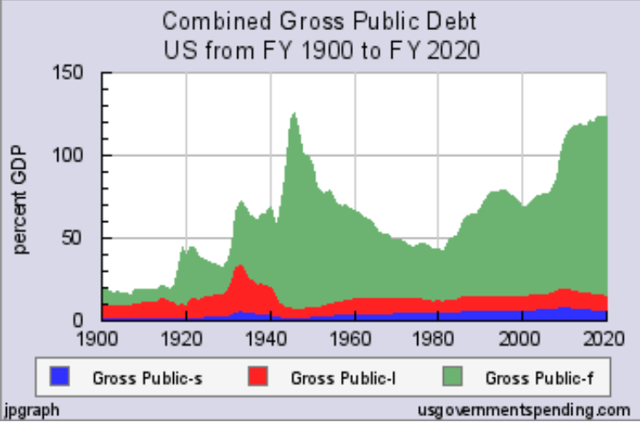 As shown in the following graph, the reported national debt of $34 trillion is currently 120% of GDP, a level only seen before in the wake of World War II. But unlike the last time, there are no signs that debt has peaked. We use a percentage of GDP to convey our ability to pay. If every dollar of output our country generates this year were used to pay our debt, it would not be enough. Of course we're not obligated to pay right away and therein lies our ho-hum attitude; we trust some miracle will solve the problem someday. But that's not the whole story. We've made promises to older people that simply can't be kept unless the promises are changed (broken) and we burden today's young people with much higher taxes; the fixes are not pretty. As shown in the last row of the following table, the present value of the promise to pay Social Security benefits is $29 trillion more than projected receipts, and adding Medicare's $47 trillion promise brings our off-the-books liability to $76 trillion, more than twice the published liability. Our all-in national debt is an astronomical 390% of GDP. Yes, Uncle Sam can avoid permanently raising all federal taxes by almost 60 percent. But this means reneging on his spending promises. But even if he cuts all forms of spending (defense spending, entitlement spending, infrastructure spending, gassing up Air Force One, you name it), the needed permanent percentage cut is 47 percent! A 60-percent permanent tax hike or a 47-percent permanent spending cut? These are our options the day after the ("magnificent" to some) tax bill was passed? How can things possibly be this bad? Here's how: Successive Congresses and administrations have been systematically lying about our fiscal condition. They spent the past six decades accumulating massive liabilities that they kept off the books via clever use of language. Congress has another choice that is equally ugly. It can print money, i.e. debase the currency. This possibility has been the driving force behind the evolution of cryptocurrencies and other ways to replace the U.S. dollar standard. In other words, this country can renege on its promises at the expense of all savers holding dollars and dollar promises. Time will tell what Congress decides, but in the meantime, we can prepare for what is likely to be very tough times. Our best response is to not rely on Social Security and Medicare, and if we think debasing is a possibility, we should save in a "currency" other than the U.S. dollar. Saving more is part of the answer, and holding those savings in other forms of "money" is the rest. Those other forms include precious metals, real assets like real estate, and perhaps foreign and crypto currencies. I say "perhaps" because foreign and cryptos can be volatile, and might not hold up in a U.S. hyperinflation. Those with defined benefit pension plans are more fortunate than those without because they have a presumed annual benefit from a viable company or union rather than the government. But they too would suffer from debasing, plus some pension plans are broke, and the insurance behind them from the Pension Benefit Guarantee Corporation (PBGC) is on the brink of bankruptcy. When the PBGC was created in 1974, Jack Treynor, Pat Regan & Bill Priest wrote The Financial Reality of Pension Funding under ERISA, where they predicted the ultimate collapse of the PBGC because it was created to insure an uninsurable risk. It would appear that the day of collapse is at hand. As it stands now, healthy plans are paying most of the premiums and have to be thinking about terminating their plans because the premiums are not fair. The PBGC is going to break unless taxpayers pick up the slack, which is totally unfair. We are broke and have decided to ignore it. The implied hope is that the repercussions will be in someone else's lifetime and that they won't be too painful. This is simply wishful thinking.